Dutch Artist's Mural On West Town Building Brightens Chicago Ave.
WEST TOWN — A mural blending animal faces and geometric patterns by a renowned Dutch street artist now covers the entire facade of a three-story building in West Town, courtesy of a local arts initiative. The taxpayer-funded public arts initiative formed by the West Town Chamber of Commerce and Chicago Trubon Gallery brought in Eelco van den Berg, a street artist known as "EELCO" who hails from the Netherlands, to create the mural. Over several days, he spray-painted the mural on the front of the Truborn Gallery building a few blocks east of Chicago and Damen. Located at 1741 W. Chicago Ave., Chicago Truborn Gallery opened two years ago and features established and emerging street and graffiti artists in its ground-floor store beneath upper floor apartments. "Haters will say it's photoshopped ..." the gallery posted on its Facebook page Monday, along with a photo of the striking purple, yellow and blue-hued mural featuring two owls, two foxes, a raccoon, cat and bird. Measuring 40-by-30, the mural is currently untitled, said Truborn curator Sara Dulkin, who's also a volunteer commissioner for West Town Taxpayer District No. 29-1014, which paid for the mural through a tax on property owners and commercial streets. The mural was funded through a $7,200 public art grant from the taxpayer district, records show. According to a news release, EELCO's distinctive style draws inspiration from animal-based folklore, resulting in a unique "graffuturist" genre that also incorporates elements of 3D modeling and geometric patterns. 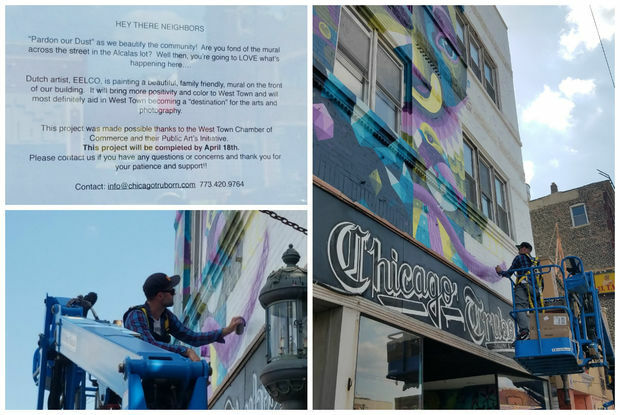 In a letter to neighbors posted on the building over the weekend, Truborn Gallery described the mural as "family-friendly" and bringing "more positivity and color" to West Town. Reached by phone on his way to New York City where he will be working on another mural, Eelco, 42, said on Tuesday that this past week was his first time in Chicago. "It was great," he said, adding he would love to return to Chicago and take in the sights. "I was facing the wall most of the week," he said. EELCO said that the people who walked by the building after he started painting the mural Thursday and through its completion late Monday were friendly and excited by what they were seeing. "They were so appreciative from the moment I got off the lift. They came up and said, 'I live here and it's such a great beautification of the street' and one offered free sushi from the sushi restaurant. For my first time in Chicago, it was very special," he said. 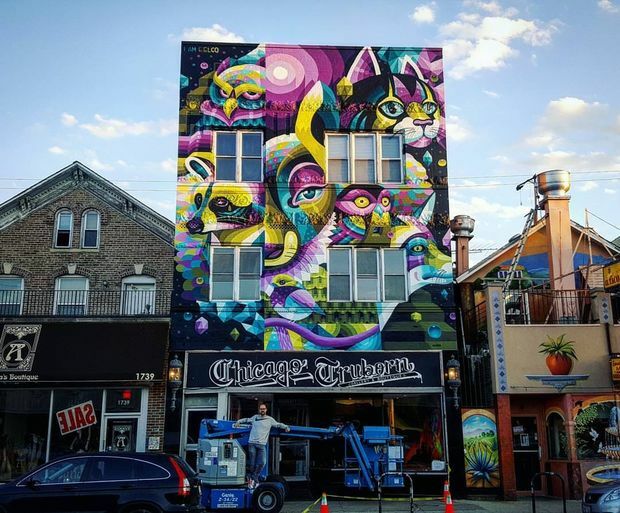 Chicago Truborn and the West Town Chamber of Commerce formed the The West Town Public Arts Initiative to designate a portion of tax funds to the beautification of the area through murals and other forms of public art, according to the news release. Last year, the initiative helped to pay for almost 25 murals in the neighborhood. In addition to the full building "facelift" that will be up indefinitely, EELCO will be part of an upcoming group show at the gallery and will produce work for a solo Chicago Truborn show in 2018, Dulkin said. Dutch artist EELCO works on a mural on Saturday, at top left is a letter posted to neighbors seeking more information.